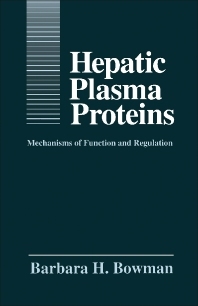 Hepatic Plasma Proteins: Mechanisms of Function and Regulation covers the mechanisms of function, inherited variation, and regulation of genes encoding the plasma proteins synthesized in the liver. The book discusses the physiological and clinical implications of human plasma protein abnormalities; the acute-phase reactants; and the variety of human plasma proteinase inhibitors. The text also describes the plasma protein vehicles (transferrin, ceruloplasmin, transthyretin, haptoglobin, hemopexin, and the vitamin D binding protein), as well as cytokines and transcription factors involved in the regulatory process. The protein and gene anatomies are discussed in terms of evolutionary relationships and genetic variations, especially those with mutations causing clinical manifestations. The book also encompasses the mechanisms responsible for tissue specific and developmental expression of plasma protein genes. Geneticists, biochemists, molecular biologists, physicians, and other students of biology will find the book invaluable.